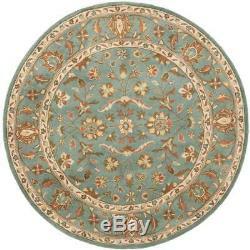 Safavieh Round Area Rug Heritage Blue 6 x 6 ft Border Floral Classic Wool New. With rich, luscious detailing and a vibrant feel, Safavieh's Heritage collection brings life to any space. Hand-tufted of pure wool with strong cotton backing, these traditionally beautiful rugs can withstand even the most highly traveled areas of your home. This is a great addition to your home whether in the country side or busy city. Cotton backing, rug pad recommended to avoid shifting and sliding. Vacuum regularly and spot clean; for hard-to-remove stains, professional rug cleaning is recommended; rotating your rugs every 3-6 months will protect against uneven wear from foot traffic and furniture weight. New wool rugs shed as a natural consequence of how they are made; vacuum a new wool rug 1-2 times a week for the first few weeks using a low pressure vacuum cleaner without beater bars; vacuum in the direction of the pile, not against it; do not pull loose ends or stray loops, clip them with scissors to remove. Use rug protectors under the legs of heavy furniture to avoid flattening piles. Avoid direct sunlight as it will cause the colors in your area rug to fade over time; place your area rug away from direct sunlight whenever possible. For an instant decorating makeover, this area rug is one of the easiest and most fashionable ways to refresh a room with character and style. Area Rug Pattern: Border, Floral. Backing Type: No Pad Attached. Flooring Product Type: Area Rug. Location Type: Bedroom, Dining Room, Entryway, Living Room, Office. Rug Material: Wool & Wool Blend. Surface Type: Brick, Carpet, Concrete, Hardwood Surface, Pavers, Stone, Tile. Customer service is our number one priority! The item "Area Rug 6 ft. 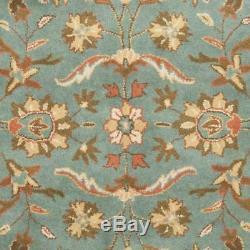 Round Wool Hand Tufted Classic Border Pattern Blue Finish" is in sale since Sunday, July 1, 2018. This item is in the category "Home & Garden\Rugs & Carpets\Area Rugs".